Belize expat Gary Peterson sometimes needs to get off the beach. And when he does, a favorite activity is chasing waterfalls. Luckily, there are plenty of spectacular waterfalls in Belize for him to find. Although there are great waterfalls elsewhere, waterfalls in Belize offer much to the adventure seeker. Many falls elsewhere offer deep, cool pools of water to swim in, but how many sit among ancient ruins? Wouldn’t you like to explore a multi-level waterfall you won’t find in any guidebook? With spectacular falls in many regions of Belize, lets check some of them out in no particular order. The first lies in the Toledo area in the south of Belize. The Santa Cruz Falls is in the Rio Blanco Waterfall Park. As you hit the trail through the tall trees, the sound of something massive fills the forest. You walk a few hundred yards and as the trail opens, there she is! The misting eruption of the pool, as the cascading water thunders down almost reminds me of the Niagara Falls. Although this waterfall is only about twenty feet tall, it’s still a thrill jumping off the upper ledge into the pool below. Now you’ve gotten your feet wet let’s look at another spectacular waterfall in Belize. The Thousand Foot Falls in the Mountain Pine Ridge Forest Reserve in the Cayo District. This waterfall is over 1,600 feet tall but referred to as the Thousand Foot Falls by locals. The viewing center is open all year long. If you are in good shape, you can hike down to the pool and enjoy water tumbling down on you. Or you can climb to an upper vantage point. This is the largest waterfall in Central America. Another great waterfall to visit is in Dangriga. The Tiger Fern Waterfalls in the Cockscomb Basin Wildlife Preserve are not for the faint of heart. Getting there involves a steep, sweaty two-kilometer hike through the mountains. But it’s well worth it. Because you’re hiking through the jungle, bring insect repellant and wear long sleeves and pants. Also bring swim gear (optional if you are lucky enough to find yourself alone at the pool). Watch out for wildlife, too. You can sometimes spot jaguars here if you‘re lucky – this is the heart of the world’s first jaguar preserve. The second-largest waterfalls in Belize are at Mile 14.5 on the Hummingbird Highway in Dangriga. Again, this is well worth the trek to enjoy the 500-foot-high Davis Falls. 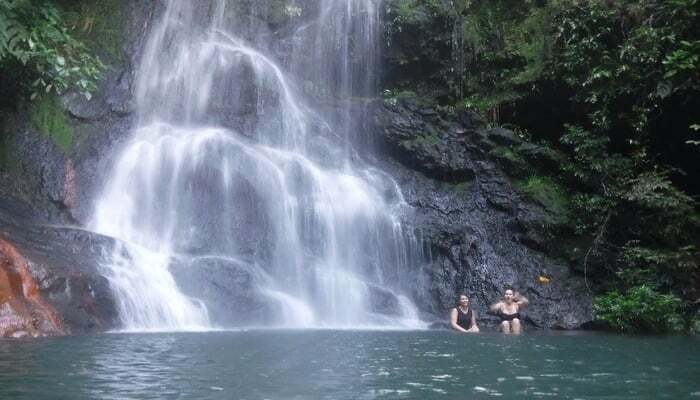 Your reward for hiking to view this waterfall is the 75-foot deep pool below to lounge in and chill off. It’s a great place to enjoy a swim and picnic lunch. Be advised you’ll need a four-wheel drive to navigate the eight miles from the Hummingbird Highway to the trailhead. Now let’s visit an area of not only historic Maya sites but also three beautiful, relaxing waterfalls. The Mayflower Bocawina National Park has only been a named park since 2001. But in that time, it has become popular. There are tours available from local villages, but it is easy to access on your own. It’s an easy ride off the Southern Highway to the Visitors Center, where you park and get a trail map. The Three Sisters, Bocawina, and Antelope Falls are all close together, and an easy hike. Hanging on the massive rocks below the falls is a cooling prize on any hot steamy day. When visiting Belize there will always be a time when you need to get off the beach. A refreshing cool off below cascading cold waters can be the perfect alternative.